There should be no question what the Edmonton Oilers’ greatest necessity is. The club desperately needs a top-pairing rearguard, preferably a No. 1 left-shooting defender. That player isn’t easy to find; even with a concerted effort the Oilers may not be able to land him and it isn’t at all clear that the team is willing to put the legwork in. If there’s one benefit to Edmonton’s nasty skid of the past few days, it might be that the obvious need for a top defenceman has been made abundantly clear to management. The great fear is that it hasn’t. I’m reasonably comfortable going forward with Oscar and Justin and Nikita and Andrew and Mark Fayne. Nikita was playing better. He started off slowly, I don’t think he was in the best shape he could have been and we have to get that rectified next year but he was getting into shape. He’s a top-four NHL defenceman. We’ll see what Jordan Oesterle has coming forward, we’ll see what Brandon Davidson has coming forward; they’re both young players, there’s optimism there that they can develop. We’ve got Darnell Nurse coming forward. Who knows what we get in the draft; we could help ourselves not only at centre but on defence depending on how this team finishes and where the bingo balls fall. Oscar Klefbom and Justin Schultz have been forced to take on tougher minutes and have been found wanting; therefore they had better not be the Oilers’ top pairing in 2015-16. This losing is terrible, but things would be a lot different if Andrew Ference, Mark Fayne and Nikita Nikitin were healthy and supporting the defence. If the Oilers brain-trust comes to the former conclusion, they have plenty of time to do something about it. If they come to the latter conclusion, 2015-16 is already a write-off. What Can One Man Do/Can One Man Be Found? Ideally, the Oilers would be extremely active this summer. Failing that, they need to make sure the moves they do make are big enough to have a real impact on the club. It isn’t ideal. I’m not at all convinced that Edmonton should be married to the Klefbom/Schultz pairing, I’d have Nikitin headed for a buyout, I’m skeptical about the abilities of several players there to live up to their positions on the depth chart and I don’t think there are six better options than Marincin. But it has the virtue of being plausible, both in terms of being attainable for a team in the Oilers’ position and being at least hypothetically palatable for MacTavish and company. And it’s a group that might just be middling enough for the Oilers to make some headway in the standings. Martin has been facing tough minutes for ages, can contribute at both ends of the rink and has a lot in common with Andy Greene, Fayne’s old partner in New Jersey who he had good success with. Klefbom and Schultz have had good stretches in a somewhat sheltered role; with a little progress from one or both they could potentially be a decent second pairing. Ference and Nikitin aren’t exciting but should be able to tread water as a third pairing; if not Marincin is a seventh defenceman who can play. Adding someone at least as capable as Martin may or may not be enough to make the defence serviceable. It should be seen as the bare minimum for MacTavish and company. I don’t believe MacT is actually comfortable moving forward with this group. The Oilers have 59 points and arguably the worst blueline in the league…how could he be? I think he’s trying to temper expectations after his “bold moves” gaffe. I also think MacT got a taste for what D cost this year and I don’t think he’s comfortable paying it. To me, that is the biggest problem. We can spitball scenarios till the cows come home…Martin, Franson, OEL, Seabrook, Krug, Campbell, Phaneuf. There will be teams with cap problems this summer. There will be teams looking to rebuild after a poor season or re-balance their roster after playoff failure. Regardless, a viable solution won’t be cheap. Since 2010, the Oilers have only executed one trade where a good prospect + pick was exchanged for a proven, quality NHL player (Paajarvi + 2014 2nd for Perron). It stands as MacT’s best move imo and something he should emulate for help on D. Klefbom, Marincin and Nurse all play the left side; they will never all play together. Throw in Davidson, Laleggia, Simpson, Musil etc and they have more D prospects than they could ever hope to play in the NHL. Move some for help now! You lost me in your first sentence. I agree 1D is a huge hole in this lineup, but until there is a goalie who regularly stops floaters from the blueline, it wouldn’t matter if we had Subban and Weber. Goal is the biggest need. OK we have 2 biggest needs. If you include management we have 15 to 20. Do you think Marincin can play the right side? If so, could you replace J Schultz with Marincin and have a 3rd pairing of Klefbom and Marincin? But we have one: Justin Schultz. If not based on merit, than certainly because he “chose” Edmonton. Can’t see anything at all that could (WILL) go wrong next year. If any one is serious about improving the Oilers next year, the one tactic that must be tried at all costs is to pry OEL out of Arizona. That should start with offering up Hall plus whatever future considerations Arizona might be dumb enough to accept. If Arizona wants hard currency then give them Draistal if you have to, but OEL. This the kind of trade that might actually move the Oilers forward next year. We have all seen enough of Hall to know he is not transcendent player, actually fairly mediocre in an all round sense. This team will never progress until its defense is fixed. For years, teams like Nashville and St. Louis have been consistently competitive on the basis of defense even with mediocre forwards, albeti big mediocre forwards. Oilers need to come to terms how uninspired their so called core actually is. Dear Hockey Gods, please smite MacT and the old boys from their “jobs for life” and let us win the draft lotto this year, and I promise not to ask for anything ever again. With McDavid, Nuge, Draisatl down the middle things are bound to improve making YEG a more attractive FA signing destination and help us get that 1st pairing D and possibly a Goalie. So the important question is ‘do Kiki and Craigers recognise the problem and will they manage to do something about it?’ MacT’s assessment of our defence last month was ridiculously optimistic. Does he know that? Is he blowing smoke to cover some obvious mistakes that he made last offseason or does he legitimately see those as good moves which in time, if the Oilers just stay the course, will bear themselves out? Anyone with a pc and a phone line can point out ad nauseum what’s wrong with the Oilers, but if those two guys don’t share the view, or willfully refuse to look in that direction, is there any point in us even looking at a sports page anymore? This situation is getting to be so depressing. 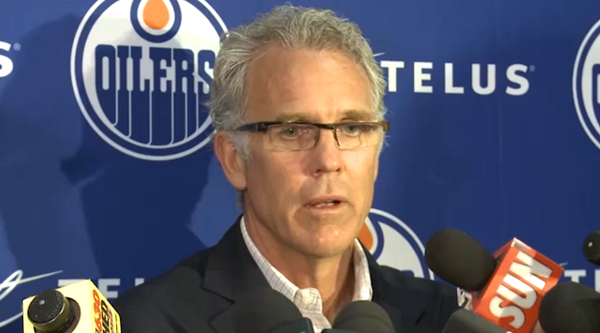 What are the odds that the next Oilers presser isn’t Craigers coming out and talking about where the 3rd overall pick is going to fit onto the Oilers’ NHL roster next season but instead features Patrick Laforge talking about who’s going to be the next president and GM of the team and how those two men are going to take charge of this sad sack organization and restore its pride? I’m no MacT apologist. I think he needs to be let go. But why would he announce to all of the GMs in the NHL that he desperately needs to make trades? He should say he is prepared to make no trades; to draft the BPA with all of his picks they’ve accumulated. I don’t have enough faith in his gamesmanship to believe that Craigers doesn’t believe everything he says to the media. What you are saying makes sense though, I just don’t think that he’s that canny a GM. I’d love to see Martin here. We wouldn’t be cup contenders but we need someone who’s actually decent. Bring in a #1 goalie and maybe we can compete for 8th place. If we’re out of the playoffs by November again next year, I will not be happy. As i always told before, best answer is KHL. League, full of underrated talented guys, in all positions. No need to longtime adaptation to NHL realities. Maybe 2-4 months. 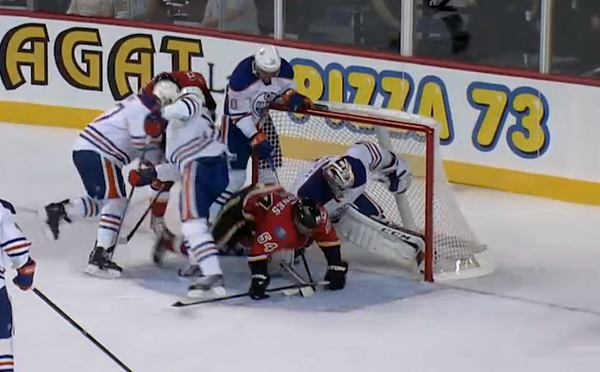 But payback is Oilers receive excellent defense. And not only defense. Double benefit for both sides. Oilers plays the role of elevator. I know, they do not need Oilers. They know about the sorry state of the team. But for them its’ a chance to cling on the world’s best league. To attract the attention of elite teams’ management. And make very good career. Of course, they do the best what they can. Benefits for Oilers. Excellent defense (finally), solid center, toothy offence – excellent results. If there was one ‘perfect’ player that would be the ‘perfect’ fit for the Oilers, whom would that be? Zdano Chara , brings everything the oil lack, great mentor for Nurse and co.
Grit, Captain and true leader, defensive, bomb from the point, and winner! Nuff said! I deal our #3 overall, Schultz, and whatever else is required. Changes the culture here immediately!!! After reading this article I was drained of all optimism. Not knocking the article at all, I’m just sickened of the reality of what we will be icing next year. Nikita,, Ference and Schultz should be gone. Klefbom on a real NHL defence would be getting sheltered minutes and allowed to develop. Marincan as well should be sheltered. Im tired of thinking of this and was going to write a big answer to one of the problems but this organization and team is a mess. I’m getting off of here so I can go watch them lose again. Why do we do this to ourselves! ?